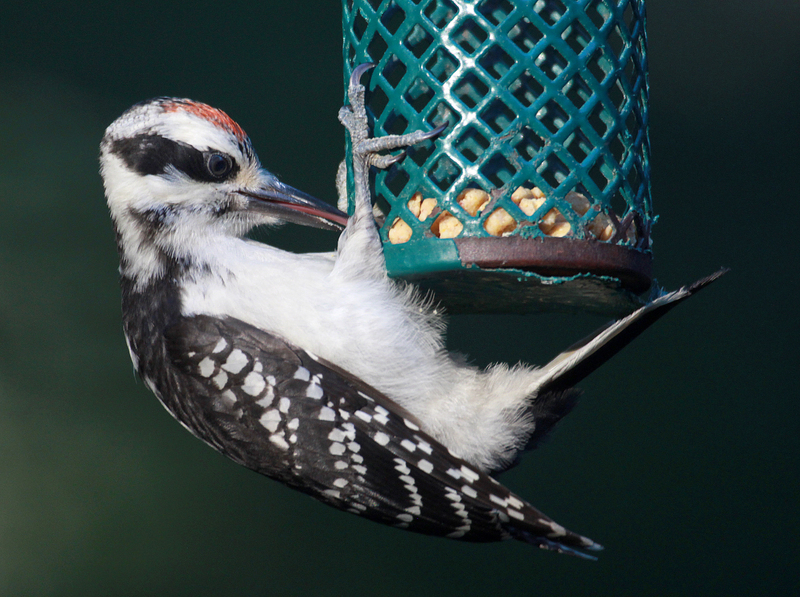 A downy woodpecker eats suet nuggets from a tube feeder in New England, summer 2018. Sometimes you have to adjust, even in the world of bird-feeding. Three mornings in a row I went into the backyard to fill the feeders for the day and noticed the hummingbird feeder on the ground. Two of those days the cap to the feeder had been jarred loose. Clearly, it was time to make an adjustment, so I moved the feeder a few feet away to the clothesline — out of reach of whatever was knocking it down. It was, as I suspected, a raccoon, as revealed by game-camera footage. The slight change of location has made a tremendous difference. It used to hang from one of the arms of the pole system, sharing space with two other feeders and a potted snap dragon flower. Hummingbirds came to the feeder, but it was dominated by a male and the larger birds that visited the other feeders often scared away the tiny hummingbirds. The other morning, I headed toward the backyard and noticed three hummingbirds near the feeder. One was on the feeder and two were perched on the clothesline nearby. I’ve never seen three hummingbirds that close together at my house before. The male is very territorial and tolerates nothing around “his” feeder. Perhaps the crowd at the feeding station had something to do with it because he is now much more chill about it all. The extra space around feeder and the built-in long perch of the clothesline apparently make him feel more comfortable. I strongly suspect — and hope — that the extra hummingbirds showing up now are first-year birds, hatched and fledged either in my yard or nearby. I’ve also seen several first-year birds of other species, such as downy and hairy woodpeckers, white-breasted nuthatches, cardinals, tufted titmice and black-capped chickadees. I even see “my” rose-breasted grosbeak pair on occasion at the feeders. That is one of the great joys of year-round bird-feeding. Many people stop feeding birds during the summer for one reason or another — bears being a big reason. I used to stop feeding birds in the summer because house finches would be my only visitors and they were eating me out of house and home. At my (relatively) new house, I hardly ever see house finches, so the seeds go longer. Unless, the chipmunks come, but that’s a story for another day. Put oranges out for orioles. I’ve tried this with no success, but that doesn’t mean it won’t work for you. Put out mealworms for bluebirds. I live in a wooded area, so I don’t see bluebirds that often. Let me know if this works for you. Keep the seed dry. Summer is hot, humid and rainy. Don’t let your seed spoil. Change hummingbird food often. Hot, humid weather will spoil sugar water in a day or two. Clean the feeders more frequently. Same reasoning — hot, humid weather is ideal for bacteria and other nasty stuff. Put suet in the shade. A hot, sunny day will wreak havoc on suet cakes. Have fun enjoying the birds as we head into the dog days of summer. And, of course, let me know what you’re seeing. This entry was posted in backyard birding, For the Birds column and tagged birding columnist Chris Bosak by Chris Bosak. Bookmark the permalink. Speaking of feeders, do you have any advice to rid them of grackles? They seem to dominate any other birds and empty the feeders. I have tried leaving the feeders empty for a few days but they find their way back. Hi Pam. There are a few things you can try. You can switch to safflower seed for a while. Grackles typically don’t like it and the regular birds should eventually adjust. Or, and this one is a bit more expensive and labor intensive, you can try to use those feeders that have a weighted mechanism that closes the holes when a large bird or squirrel tries to use it. Otherwise, just wait until the grackles move on, which they will eventually. Thanks for writing Pam! Great! i will try safflower seed first.